If part of your renovation is to re-roof your home or you are in the process of planning a new build and need to decide on a roof style then this blog may provide you with some guidance. Understanding current trends along with the pros and cons that come with each of them may help you to decide which style will work best for you. 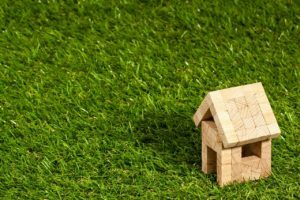 There’s a few factors to consider when choosing a roof such as your budget, energy efficiency expectations, community covenants, council requirements and of course building codes. Architectural style obviously plays a huge part in roof design so you should also consider the style of your building. There are a wide variety of styles available but we talk about a few of the most common ones used here in Australia. A gable roof is most commonly used on ‘Californian bungalow’ style homes and is easily identifiable by its triangular shape. 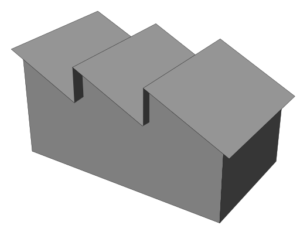 It consists of two flat surfaces sloping in opposite directions and placed together at the horizontal edge to form a ridge. 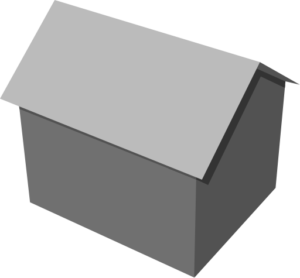 The triangular portion which sits under the roof pitch is the ‘gable’. The pitch provides good drainage and a spacious attic for storage. Gable roofs are easily ventilated and can also offer the option of high ceilings. A gabled roof is quite often used in combination with a hipped roof. This type of roof is probably the most popular style in Australia. Depending on the shape of the house it can have three or four (or sometimes more) pitched planes which slope downwards from a ridge at the top of the roof. The angle they generally fall is between 22.5 & 25 degrees, they provide good drainage and shade along with great stability with high wind resistance. As with a gable roof this type of roof will also provide a nice spacious attic. It’s important to note that this style of roof can be more prone to leaks if not installed correctly. While flat roofs appear to be flat, they will always have a slight pitch for water runoff. The benefits of choosing a flat roof include things such as affordability, a faster build (due to its simplicity) and the space for of installation of solar panels. In some situations you can also consider using a flat roof as an extra entertaining area. This shape roof tends not to last as long as other styles because of water pooling, and will require more maintenance due to debris gathering on top. A skillion roof is a single sloping, flat roof which has a significant pitch. Because of the single pitch it has minimal to no joins which reduces the risk of water issues. In Australia a skillion roof can also be known as a’shed roof’ and are often installed because they are cheap, easy and fast to construct. More recently the skillion roof has gained popularity in residential buildings and is no longer seen only on sheds, carports and industrial buildings. The butterfly roof is as the name suggests, it’s shaped similar to the wingspan of a butterfly by consisting of 2 flat planes slanting towards each other with a box gutter sitting in the middle. This style enables use of large, high windows to create a light, open and modern space. Sustainability is a big feature with this style with plenty of room for solar panels to be installed and the ability to harvest and reuse captured water from the central box gutters. But be warned that these things all come at a cost, with the high price for the complexity of this design and the frequent maintenance required to keep your home leak free. Sawtooth roof designs are most commonly seen on industrial buildings but are becoming more and more popular in modern residential buildings. The profile of this style has multiple parallel pitches followed by a parallel vertical surface. This could be seen as resembling a continuous row of skillion roofs all angled in the same direction. The vertical element of the design is generally fitted with glass panels or windows which allows plenty of natural light to filter into the interior space without the glare and heat from the sun. A sawtooth roof has plenty of space for solar panels and provides high ceilings and light, open interiors. The downside to this type of roof is the high maintenance and high costs due to the complexity of the design. Other less common roof designs found in Australia are dome, cross-hipped, cross-gabled, saltbox and bonnet roofs. As with most things, sometimes too many options can be overwhelming and confusing. The roof of your house is a big decision and should, most of the time, be left to the designer/architect to decide on which style will be best suited. But of course, it’s interesting for you to know your options and their differences. For assistance with any residential or commercial decorating or design projects please contact the team of Inspired Spaces.